Organiponic, Inc. is focused on creating the best organic hydroponic systems. These include home gardening, in-home installations, and commercial agriculture which all provide significant advantages over the options available today. 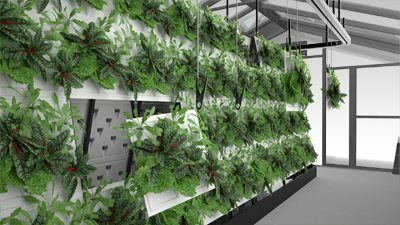 So far, Organiponic has nine hydroponic systems, and each system is designed for a specific market with a primary focus of high produce yields of quality lettuces, greens, and herbs. Each system has features specifically designed with the end-user in mind, namely low price, ease of use and clean-up, and low ongoing cost for seeds & nutrients, etc. allowing for approximately 75% savings on fresh quality produce. The OS systems are designed to utilize natural light (with available optional LED lighting components). OS systems are durable, long lasting systems constructed with few moving parts. Here are Organiponic’s 3 Most Popular in-home models. Organiponic has state-of-the-art modular systems that are scalable for commercial agriculture. Compared to traditional farming requirements, Organiponic commercial systems provide huge advantages to farmers! These advantages include planting and harvesting time, water costs, and the monetary costs (without the need for heavy machinery, vehicles, and expensive farming equipment). Another advantage is the ability to grow year-round without being affected by weather conditions, pollution, and other environmental elements that are beyond farmers’ ability to control. Our systems are proprietary in design to incentivize the customer to purchase the monthly growing kit. Each kit is incredibly affordable, costing approximately $15 per month. Appealing Design: Systems are designed to be an appealing appliance almost anywhere in the home. Quality Fresh Year-round Produce: It takes an average of 28 days to grow greens and herbs from seedlings. Fresh produce every day of the year. Safe and Clean Produce: No need for pesticides. You are the grower; you know how the plants were grown. Very Easy to Set-up: Monthly grow kit pricing would be approximately $10 – 12 with monthly subscription. Every system purchased comes with a “starter grow kit” that includes the monthly grow kit plus standard seeds. Easy to Propagate Seeds: Propagation typically takes 7 – 14 days and growing 14 – 28 days. Maximize your produce production by propagating the ready-to-use trays – very easy. No Need to be a Farmer: If propagation seems too hard, just add the seed to the medium plug and place into the plant pocket. Same quality produce just takes a little longer to grow. Seedlings Delivered: Still too difficult? Purchase seedlings and just add to the grow plant panel. This kit is designed for consumers who want seedlings (bypass the ‘seed-to-seedling’ grow stage. these “Seedling grow kits will price around $18-24 each. Grow kits include trays, nutrient solutions, and medium with seeds custom ordered at a additional price. Low Energy Costs: The Organiponic grow kits provide one of the lowest ongoing costs to consumers, with monthly plant costs as low as $0.45 each. Supplies Delivered to your Home: No need to make a monthly list of supplies. Our grow kit includes everything you need, with scheduled monthly delivery. Easy to Use App: Our free app instructs the grower when to add nutrients, when to clean, and a convenient shopping link for special seeds and other cool stuff. One Less Item to Purchase at the Grocery Store: Who likes carrying groceries up-stairs, need I say more. Less Waste: In America, 50% of all produce is thrown away. Produce on the OS systems are still alive, therefore it lasts longer, fresher, and keeps it’s phytonutrients longer than store bought produce. Cleantech and Sustainability: One of the fastest growing industry segments in the world today. Affordable to Everyone: The consumer products are reasonably priced to allow for hydroponic growing methods to become mainstream. The Table Top system will be priced at $349. The ongoing costs for the grow kit and selected seeds are very low – approximately $10 – $12 per month. Also, since Organiponic systems require about 90% less water per plant than traditional methods, the system pays for itself in 9-12 months, at roughly $0.45 – 0.65 per plant. This assumes the average cost for pesticide-free lettuces, greens and/or herbs is $1.99. In most cases, pesticide free produce and herb prices are much higher. Health-minded: More people are seeking a cleaner, more balanced diet while trying to avoid processed foods. Our systems are designed to provide ready-to-eat produce every day to the millions that demand a fresh, pesticide free alternative. Consumers Desire Local and Fresh: In the last few years, the number of Farmers Markets in the US has doubled. Individuals are demanding fresh, local produce, either organic or free of pesticides. With an OS system, consumers can pick greens, lettuce or herbs right off the system for use immediately. No need to purchase greens and herbs from the Farmers Markets or Grocery stores at inflated prices. Individuals who want Environmentally Friendly Products: The OS systems use just the right amount of nutrients and water that is aeroponically sprayed on to the roots of the plants. Nutrient solution not absorbed into the roots drips back into the basin. OS systems use 80-90% less water per plant than traditional soil farming. Gardeners: Outdoor gardening is an activity or hobby enjoyed by many individuals, whether it’s a large garden in the back yard or several pots on a back porch. With the OS consumer systems, garden enthusiast can garden indoors year-round. Also a great addition to an existing backyard greenhouse, taking up very little space. Millennials & City Dwellers: Today, many consumers want convenience. The OS consumer systems are designed to be very easy to use and easy to clean. 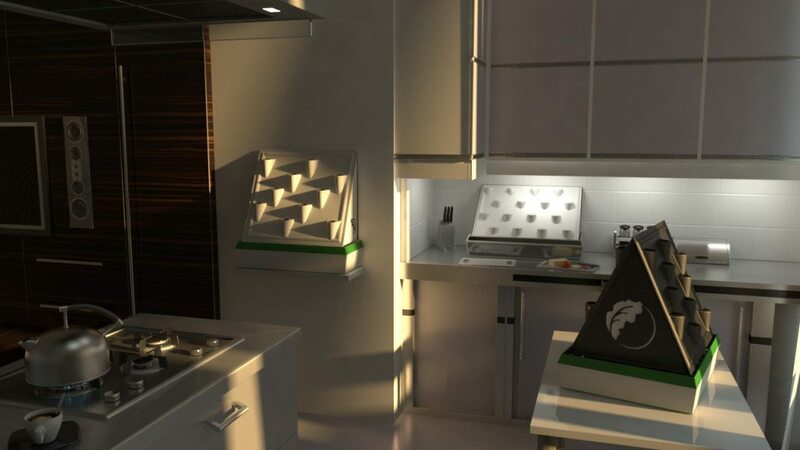 It’s a new appliance for the home kitchen, although it can be placed wherever the consumer desires, as long as there is light (3-4 LED light options available) and temperature control. Each system takes up approximately 2-3 square feet of space and can grow 12-24 plants. Experienced farming is NOT a pre-requisite. Consumers can choose to propagate seeds at home or purchase seedlings to begin the growing process. As the plant matures, harvest the desired produce and enjoy your meal. Perfect for the millennials, or anyone who wants great tasting produce that is fresh from a grow system that is easy to use. “Off-the-Grid” Lifestyles: There are an estimated 250,000 people (180,000 in 2006, according to US Today) in the US that claim to live off the grid. The “Off-the-Grid” lifestyle means no use of public electric power. OS is working on a pump/timer system that runs on a battery pack using solar power. This allows for year-round produce in remote areas. This product should be available in 2017. “Do-It-Yourself” (DIY) Market Opportunity: We believe we can broaden the market by encouraging the DIY market to build their own systems using our panels and/or pump & timer. We can also save them money on nutrients, medium and quality seeds. Our intention is to develop a blog allowing DIY to discuss their home-built grow systems amongst anyone who visits the blog.